Five pounds of Jamaica’s finest ganja. 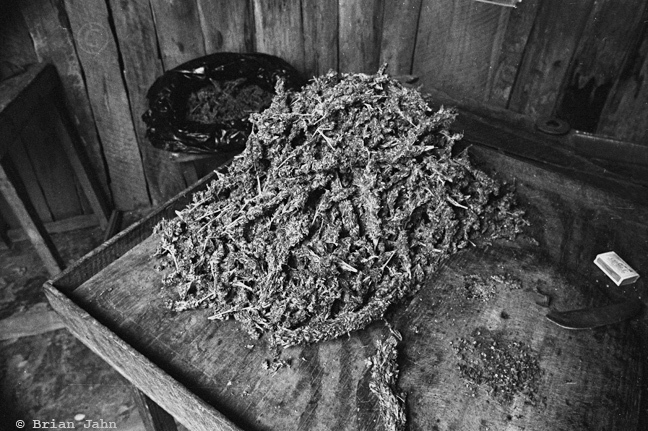 First brought to the island by East Indian contract laborers in the mid 1800’s, ganja has been used in Jamaica in one form or another for over 150 years. In the 1930’s, it was adopted as a sacrament by the Rastafarians, a use that still continues today. It goes by many names: ganja, collie, illie, herb, ishence, sensi, indica, high grade. Ganja is widely used by around 60% of the island’s population and of course is big business. The Lambs Bread of Bob Marley’s days is long gone; today ganja farmers are growing a wide variety of strains, getting their seeds from places like Amsterdam and Canada. In the 1970’s, ganja became one of Jamaica’s biggest exports. This had an unintentional effect on tourism, bringing planeloads of young people to the island looking to sit on the beach soaking up the blazing sun while burning a few spliffs. Marijuana also has a long history in Jamaican music. Songs with titles like “I Love Marijuana,” “Marijuana In My Brain,” “Marijuana In My Soul,” “Smoke Marijuana,” “Sensimillia,” “Cool Cool Collie,” “Jamaican Collie” and “100 Weight Of Collie Weed” are just a few of the hundreds and hundreds of songs that have been written about ganja over the years. Whether it’s mento, ska, rock steady or reggae, they all have songs in praise of the herb. Many artists have been passionate herb smokers and advocates, some even going to prison for it. In 1966, Toots Hibbert of Toots and the Maytals fame served 18 months for ganja, inspiring his hit, “54-46 That’s My Number” – a reference to his prisoner number. Bob Marley is perhaps the best-known reggae star/ganja smoker. He sang about it in “Kaya,” “Three O’Clock Roadblock” and many other songs. His love for ganja was surely no secret. This image was shot for the High Times magazine Jamaica issue back in 1997. (We also interviewed Bunny Wailer for that issue.) The magazine had wanted a centerfold shot for the issue so we had to find a fairly large amount of ganja. We drove out to one of the local beach communities outside of town with my good friend, the late reggae percussionist Sydney Wolfe. He said he knew a few people out there who could help us in our quest. It wasn’t long before we found what we were looking for. Since we didn’t want to really “buy” any ganja so we ended up making a deal to just rent it for an hour or so. This image is also shot in color as well. Soon come: chalice-smoking shots!